Making Cheddar produces a lot of extra Whey. 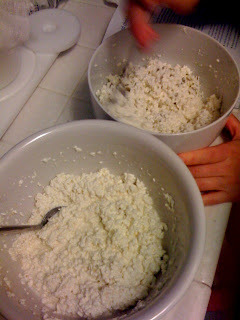 I've been making Ricki Carroll's "Ricotta from Heaven" with the leftovers, which produces about a cup of ricotta. This time I wanted to branch out and hopefully get a little bit more. Following her "Whey Ricotta" recipe, it's actually a little simpler. 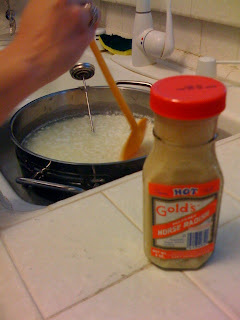 It involves adding some extra milk, heating the whey to 200 degrees, and then adding some vinegar to curdle what's left. 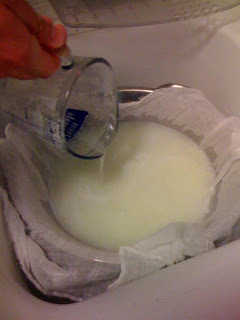 Straining through butter muslin, and draining for about 2 hours, produced about two cups of Ricotta. The texture was quite nice, but the vinegar flavor sticks around. It's subtle, but it's definitely there. Not sure if the vinegar flavor (and cost of an extra quart of whole milk) is worth the extra yield. 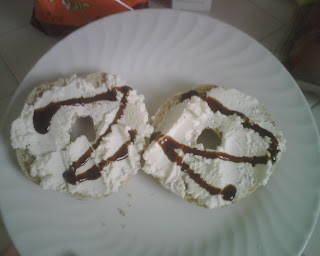 Dana just sent me this picture of her breakfast... Whey Ricotta on a bagel, with Balsamic Glaze. Mmmmm! I just came across this interesting scary article about the perils of making cheese from unpasteurized milk. US Law says that if cheese is made from unpasteurized milk it must be aged for at least 60 days. That gives it enough time for any "nasties" to die off. Apparently many Hispanic immigrants in Southern California are eating queso fresco made from unpasteurized milk, and then catching a rare form of TB. Yikes! 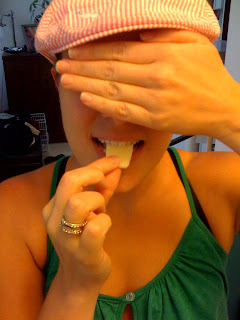 Last week my friend Dana came over to join in the cheese-making festivities. I've been wanting to make Manchego for awhile, and I was excited to have some help in the kitchen for this somewhat more involved cheese. 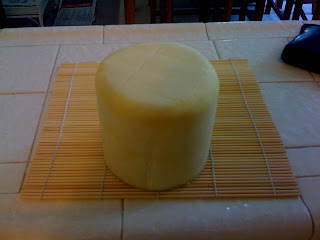 Manchego is from Spain, originally made with sheep's milk--but for our purposes, we opted for cow's milk. I believe Manchego is now often made in Mexico with cow's milk as well. It can be aged for anywhere from 5 days (Manchego Fresco) to 12 months (Manchego Aciete), developing a stronger flavor as it ages. We then cooked the curds, slowly bringing the temperature up from 80 degrees (they had cooled off a bit from the 86 degrees at which we curdles the milk) to 104 degrees, no more than 2 degrees every 5 minutes. 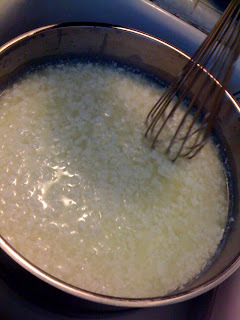 That took about 45 minutes... All the while stirring slowly to keep the curds from sticking together. We then pressed the curds, flipping the block of curds several times (at 15 minutes and 15 lbs each time), and then again at 30 lbs for 6 hours. 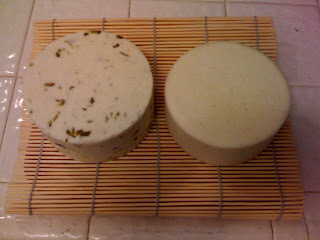 After that, we it soaked the cheese in brine for 6 hours at 55 degrees. The last step was to dry it off and then coat it with olive oil to keep it from drying out while it ages. I don't think I'll be able to wait the full twelve months... But maybe we'll see how it's doing after a couple of weeks.